Not that the other processes for building this airplane aren’t critical, but positioning and installing the main spar is certainly one of the more critical processes here. Eventually the wings are attached to this spar so if it isn’t level, well, dealing with it later is an issue that doesn’t sound pleasant! See the construction details on this page! 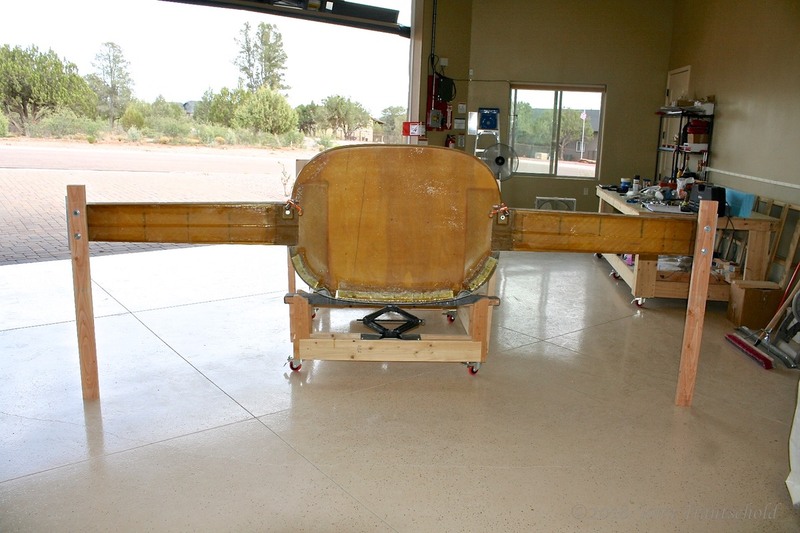 The first step is to cut access holes in both the fuselage and the engine bulkhead to make room for the spar. The access hole in the fuselage is fairly straight forward but the hole in the bulkhead is a bit tricky. I’ve pre-marked that hole as you can see in the photo below. 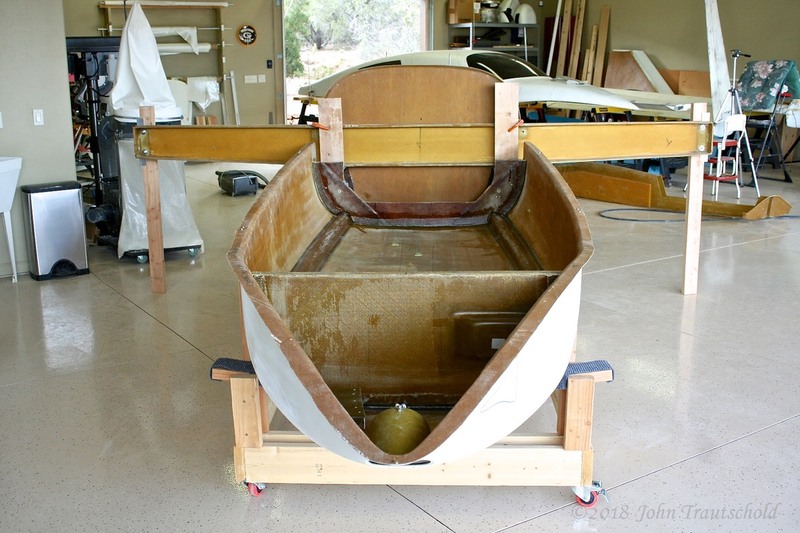 The main spar actually sweeps back a bit so after the hole is cut in the bulkhead, an angle needs to be sanded into the plywood used for the bulkhead so that the spar fits snugly against that bulkhead. 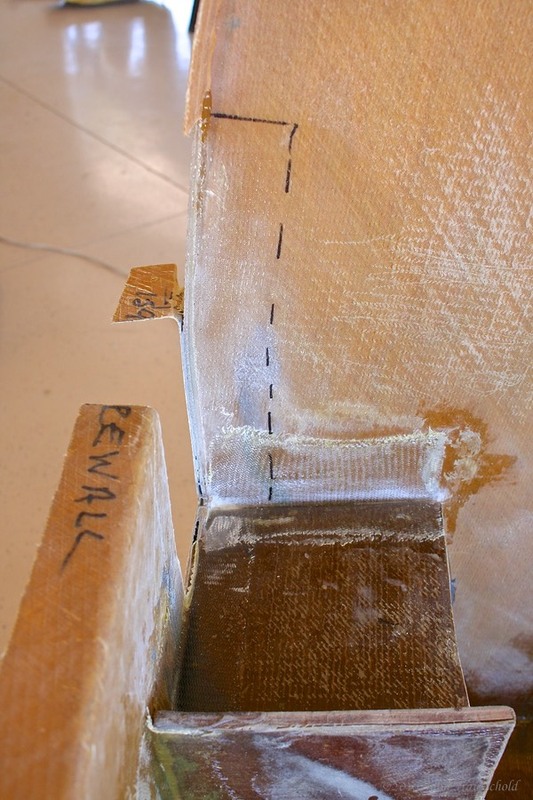 The main spar passes through the fuselage so an area needs to be cut out of the fuselage. I've also marked the location for the cut that needs to be made in the firewall for the main spar. Installing the spar is a real 3D jigsaw puzzle! 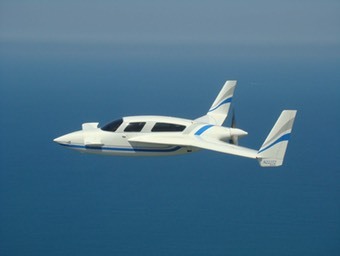 After checking to make sure that the fuselage is still level, the spar needs to be horizontally level; the hardpoints need to be vertically level and level to each other (so that both wings end up in the same plane); and finally the sweep needs to match from the top hardpoints on each side to the reference hole at the front of the fuselage! 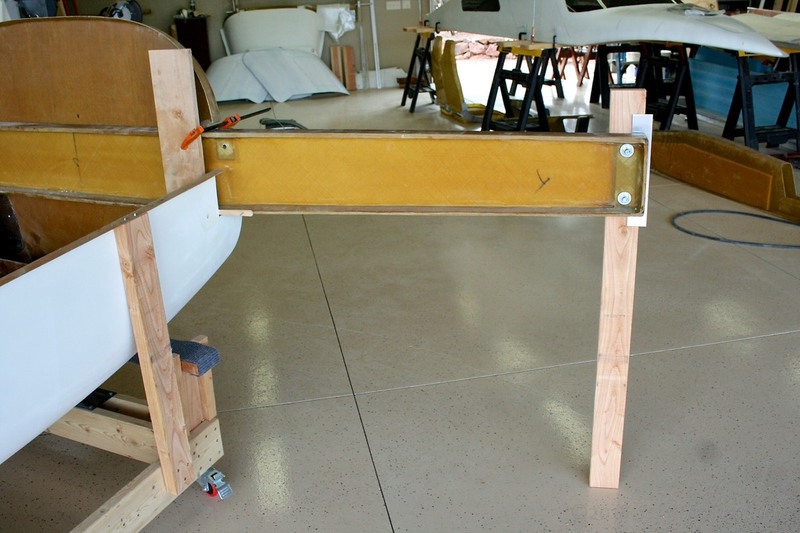 I decided to use some boards to clamp the spar in place using the hardpoints. I also clamped some metal strips between the board and the spar so that I could measure vertical level. Finally, I just used a long tape measure clamped to each hard point to measure the sweep. In the end, everything checked out level and my sweep measured within a sixteenth of an inch. I hope that’s close enough! Here I'm clamping and locking the main spar into place. Getting the spar level is a real 3D jigsaw puzzle. The metal bar is used to check vertical level for the bolt holes that eventually are used to attach the wings. Here's a side view of the process I used to get the spar level. And here's a view from the front showing everything clamped in place. 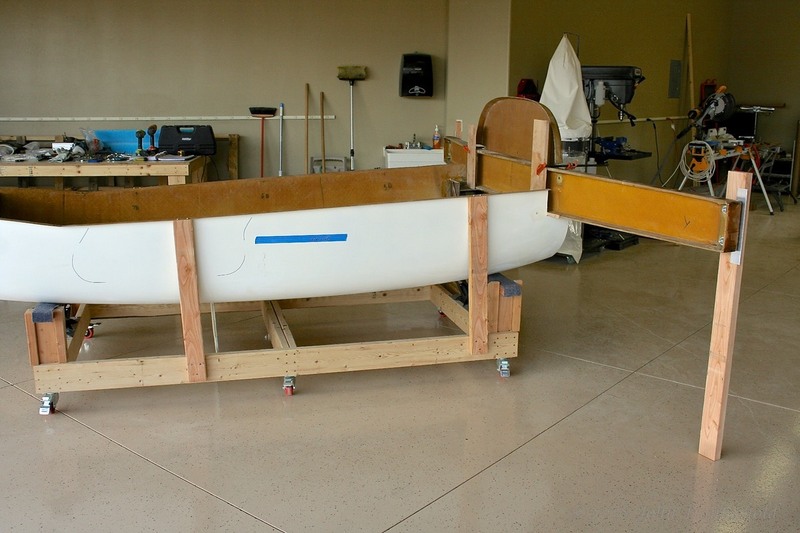 The next step, once everything checks out, is to take it all apart and epoxy it into place. Of course, doing that means that, while the epoxy is still soft, I need to re-measure it all to make sure that when it’s all back together it’s still level. In the end it seems to have worked out ok, but gluing it in is a bit tense because once that epoxy cures, there’s no getting this spar back out again! Once the structural epoxy is cured, there are a ton of layups that are used to strengthen the installation. The first layup is shown below. Using some Dyvinicel structural foam, ramps are made to span the open space between the gear bulkhead and the top spar cap. Four layers of triax are used to lock this in place. 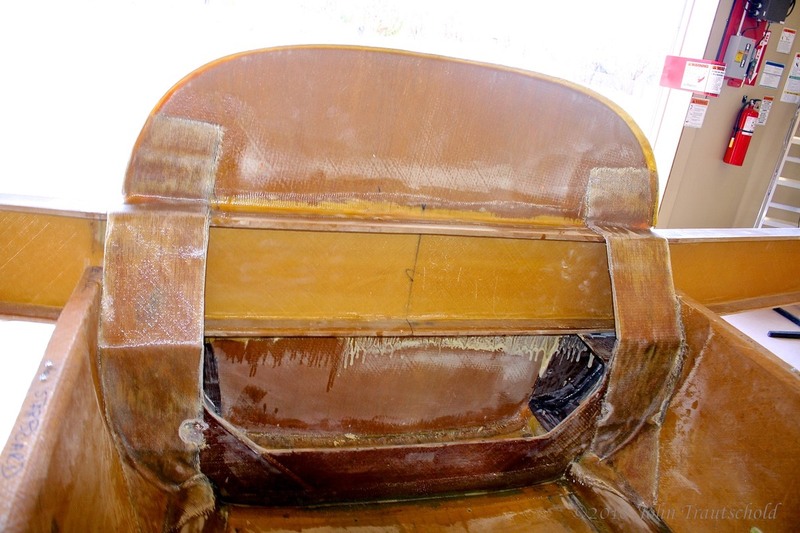 There are also some BID layups at the top and bottom of the spar to seal and reinforce the junction between the upper and lower spar caps and the back of the engine bulkhead. The spar is epoxied in and here I've started the reinforcement layups to help lock it all in place. There are more strengthening layups needed so stay tuned for that a bit later once it’s all finished.